While the eastern half of the United States is having a cold winter so far, the same has not been true in Italy. The days I spent teaching in Florence (Firenze), at the Galileo Galilei Institute (GGI), were somewhat warmer than is apparently the usual, with even low temperatures far above freezing almost every night. A couple of people there said to me that they “hadn’t seen any winter yet”. So I was amused to read, on U.S. news websites, yet more reports of Americans uselessly debating the climate change issue — as though either the recent cold in the eastern U.S. or the recent warmth in Europe can tell us anything relevant to that discussion. (Here’s why it can’t.) It does seem to be widely forgotten in the United States that our country occupies only about 2% percent of the area of the Earth. All particles in our world — elementary particles such as electrons and photons, and more complex objects such as atoms — are either fermions or bosons; the classic example of a fermion is an electron. The essential property of fermions is that two identical fermions cannot do precisely the same thing at the same time. For electrons in atoms, this is known as the Pauli exclusion principle (due to Wolfgang Pauli in 1925, based on 1924 research by Edmund Stoner): no two electrons can occupy the same quantum state. All of atomic physics and chemistry, and the very stability of large chunks of matter made from atoms, are dependent upon this principle. The properties of fermions also are crucial to the stability and structure of atomic nuclei, the existence of neutron stars, the electrical properties of metals and insulators, and the properties of many materials at cold temperatures. Inside the building is a plaque commemorating Fermi’s great achievement. 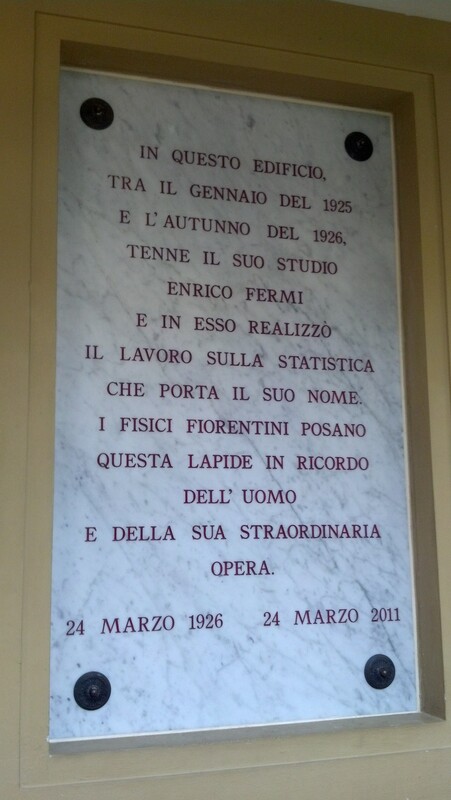 But Fermi did not remain long in Florence, or even in Italy. A mere 15 years later, in the midst of the Fascist crisis and war in Europe, and having won a Nobel Prize for his work on radioactive atoms, Fermi had taken a position in the United States. There he directly oversaw the design, building and operation of humanity’s first nuclear reactor, in a secret underground laboratory at the University of Chicago, paving the way for the nuclear age. But the main reason the Arcetri hill is famous for science is, ironically, because of a place of religion. Both of Galileo’s daughters had taken the veil, and in 1631 the aging scientist was prompted to rent a villa on a small farm, within sight and a short walk of their nunnery. Unfortunately, what must have seemed like an idyllic place to grow old and do science soon turned into a nightmare. After years of coexistence with and even support from within the Catholic Church, he had pushed too hard; his publication in 1632 of a comparison of the old Ptolemaic view of the universe, with the Earth at the center, with the newer Copernican view (to which he had greatly contributed, through his astronomical discoveries, in the 1610s), engendered a powerful backlash from some who viewed it as heretical. He was forced to spend 1633 defending himself in Rome and then living in exile in Sienna. When he was allowed to return to Arcetri in 1634, he was under house arrest and not allowed to have any scientific visitors. Shortly after his return, his 33-year-old daughter, with whom he was very close, died of a sudden and severe illness. His vision failed him, due to unknown diseases, and he was blind by 1638. Unable to go to Florence, his home town, scarcely three miles away, and rarely able to meet visitors, he spent the rest of his time in Arcetri isolated and increasingly ill, finally dying there in 1642. Yet despite this, or perhaps because of it, Galileo’s science did not come to a halt. (This was also partly because of the his support from the Grand Duke of Tuscany, who interceded on his behalf to allow him some scientific assistance after he went blind.) At Arcetri, Galileo discovered the moon did not always present exactly the same face toward the Earth; it appears, to us on Earth, to wobble slightly. The explanation for this so-called “lunar libration” awaited Issac Newton’s laws of motion and of gravity, just 50 years away. And he finished formulating laws of motion (which would also later be explained by Newton), showing that (on Earth) objects tossed into the air follow a trajectory that mathematicians call a parabola, until affected by what we now call “air resistance”, and showing that uniform motion cannot be detected — the first Principle of Relativity, authored 270 years before Einstein presented his revision of Galileo’s ideas. 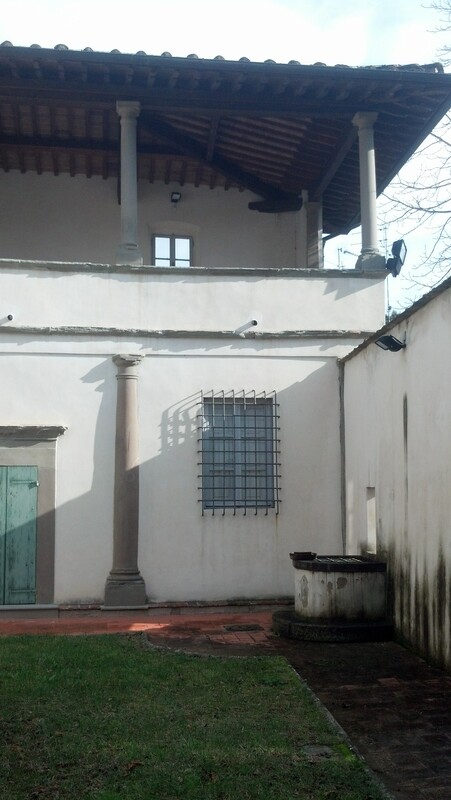 To step into Galileo’s villa, as I did a few days ago, is therefore to step into a place of intense personal tragedy and one of great scientific achievement. One can easily imagine him writing by the window, or walking in the garden, or discussing the laws of motion with his assistants, in such a setting. It is also to be reminded that Galileo was not a poor man, thanks to his inventions and to his scientific appointments. 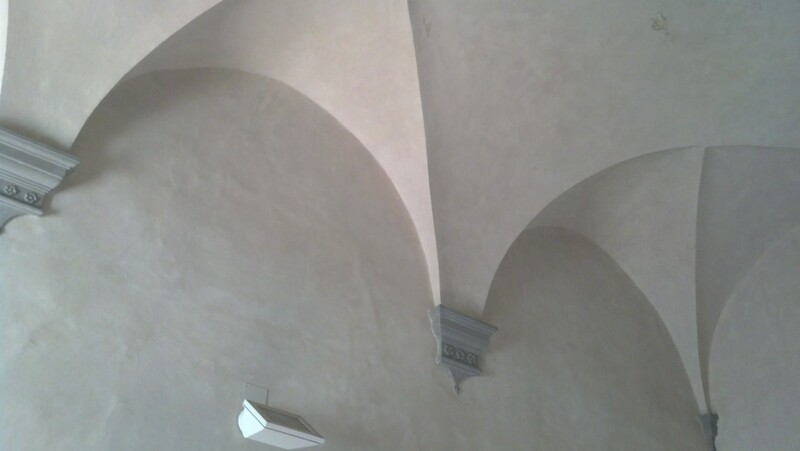 The ceilings of the main rooms on the lower floor of the villa are high and vaulted, with attractively carved supports. There is a substantial “loggia” on the upper floor — a balcony, with pillars supporting a wooden roof, that (facing south-east, south and west) would have been ideal, while Galileo could still see, for observing the Moon and planets. While Galileo’s luck ran badly in his later years, he had an extraordinary string of luck, as a younger scientist, at the beginning of the 1600s. First, in 1604, there was a supernova, as bright as the planet Jupiter, that appeared in the sky as a very bright new star. (Humans haven’t seen a correspondingly close and bright supernova since then, not even supernova 1987a. There is one you can see with a small telescope right now though.) Observing that the glowing object showed no signs of parallax (see here for a description of how parallax can be used to determine the distance to an object), Galileo concluded that it must be further away than the Moon — and thus served as additional evidence that the heavens are not unchanging. Of course, what was seen was actually an exploding star, one that was nearly a trillion times further from the Earth than is the Moon — but this Galileo could not know. and the vast number of stars in the Milky Way that aren’t visible to the naked eye. One often hears 1905 referred to as Einstein’s miracle year, when he explained Brownian motion and calculated the size of atoms, introduced the notion of quanta of light to explain the photoelectric effect, and wrote his first two papers on special relativity. Well, one could say that Galileo had a miracle decade, most of it concentrated in 1610-1612— playing the decisive role in destroying the previously dominant Ptolemaic view of the universe, in which the Sun, Moon, planets and stars orbit in a complex system of circles-within-circles around a stationary Earth. We live in an era where so much more is known about the basic workings of the universe, and where a simple idea or invention is rarely enough to lead to a great change in our understanding of our world and of ourselves. And so I found myself, standing in Galileo’s courtyard, feeling a moment of nostalgia for that simpler time of the 17th century, cruel and dangerous as it was… a time when a brilliant scientist could stand on the balcony of his own home, looking through a telescope he’d designed himself, and change the world-view of a civilization. This year’s Nobel Prize, presumably to be given for the prediction of the particle known today as the “Higgs boson”, will be awarded next week. But in the meantime, the American Physical Society has made a large number of awards. A few of them are to people whose work I know about, so I thought I’d tell you just a little about them. The J. J. Sakurai prize went to Professors Zvi Bern, Lance Dixon and David Kosower, for the work that I have already described on this website here and here. Dixon, a wide-ranging expert in particle physics, quantum field theory and string theory, was a young professor at the Stanford Linear Accelerator Center when I was a Stanford graduate student. He taught an excellent course on string theory, and provided a lot of scientific advice and insight outside the classroom. Bern and Kosower were young scientists using string theory to learn about how to do computations in quantum field theory, and their surprising results formed the starting point for my Ph. D. thesis (which has their names in its title.) The range of their work is hard to describe in a paragraph, but let’s just say that no one is surprised that they were awarded a prize of this magnitude. four-manifold theory: the mathematics of spaces which have four-spatial dimensions, or three-spatial dimensions and one-time dimension. These spaces are very interesting to mathematicians, and also, they’re interesting because we live in one. This is not the complete range of Moore’s work by any means. Unfortunately this website doesn’t yet have pages that can put his work in proper context, but perhaps I’ll return to it later. But again, no surprise here to see Moore’s name on this award. The Tom W. Bonner Prize in Nuclear Physics was awarded to experimental physicist William A. Zajc, currently chairman of the Columbia University physics department. Zajc has been heavily involved in one of the most surprising discoveries of the past fifteen years: that a hot dense fireball of quarks, anti-quarks and gluons (produced in the collision of two relatively large atomic nuclei) behaves in a very unexpected way, more like a very low viscosity liquid rather like than a gas. I’ve known him partly because of his interest in the attempts to apply string theory to certain quantum field theories that are perhaps relevant in the modeling of this novel physical system… something I’ll also probably be writing about in the relatively near future. And the W.K.H. Panofsky Prize in Experimental Particle Physics went to Kam-Biu Luk (Berkeley) and Yifang Wang (Director of China’s Institute of High Energy Physics): For their leadership of the Daya Bay experiment, which produced the first definitive measurement of the theta-13 angle of the neutrino mixing matrix. For the same experiment, the Henry Primakoff Award for Early-Career Particle Physics went to Daniel A. Dwyer of Lawrence Berkeley Laboratory. I wrote about the Daya Bay measurement here; their result is one of the major measurements in particle physics in the past few years. I wish I knew more about the other recipients outside my areas of expertise, but other bloggers will have to cover those stories. Anyway, no surprises, but some very deserving scientists. Let’s see if next Tuesday brings the same result. I spent the last two days at an extraordinary conference, “Dreams of Earth and Sky”, celebrating the life and career of an extraordinary man, one of the many fascinating scientists whom I have had the good fortune to meet. I am referring to Freeman Dyson, professor at the Institute for Advanced Study (IAS), whose career has spanned so many subfields of science and beyond that the two-day conference simply wasn’t able to represent them all. The event, held on the campus of the IAS, marked Dyson’s 90th year on the planet and his 60th year as a professor. (In fact his first stay at the IAS was a few years even earlier than that.) The IAS was then still a young institution; Albert Einstein, John Von Neumann, Kurt Gödel and J. Robert Oppenheimer were among the faculty. Dyson’s most famous work in my own field was on the foundations of the quantum field theory of the electromagnetic force, “quantum electrodynamics”, or “QED”. His work helped explain its mathematical underpinnings and clarify how it worked, and so impressed Oppenheimer that he got Dyson a faculty position at the IAS. This work was done at a very young age. By the time I arrived to work at the IAS in 1996, Dyson had officially retired, but was often in his office and involved in lunchtime conversations, mostly with the astronomers and astrophysicists, which is where a lot of his late career work has been centered. Retirement certainly hasn’t stopped Dyson’s activity. His mind seems to be ageless; he is spry, attentive, sharp, and still doing science and writing about it and other topics. When I went up to congratulate him, I was surprised that he not only remembered who I was, he remembered what I had been working on in 1992, when, as an unknown graduate student on the other coast, I had sent him a paper I had written. By the way, it’s somewhat bizarre that Dyson never won a Nobel Prize. Arguably it is part of the nature of the awarding process, which typically rewards a specific, deep line of research, and not a polymath whose contributions are spread widely. Just goes to show that you have to look at the content of a person’s life and work, not the prizes that someone thought fit to award to him or her. Still, he has his share: Dannie Heineman Prize for Mathematical Physics 1965; German Physical Society, Max Planck Medal 1969; Harvey Prize 1977; Wolf Foundation Prize in Physics 1981; American Association of Physics Teachers, Oersted Medal 1991; Enrico Fermi Award 1995; Templeton Prize for Progress in Religion 2000; Henri Poincaré Prize 2012. The thirteen talks and several brief comments given at the conference, all of which in one way or another related to Dyson’s work, were organized into sessions on mathematics, on physics and chemistry, on astronomy and astrobiology, and on public affairs. All of the speakers were eminent in their fields, and I encourage you to explore their websites and writings, some of which were controversial, all of which were interesting. For non-scientists, I especially recommend Stanford Professor Emeritus Sid Drell’s extremely interesting talk about nuclear disarmament (which he’s been working towards for decades), and a thought-provoking if disconcertingly slick presentation by Dr. Amory Lovins of the Rocky Mountain Institute on what he sees as a completely realistic effort, already underway, to wean the United States of its addiction to oil — with no net cost. Those with a small to moderate amount of scientific background may especially enjoy MIT Professor Sara Seager’s work on efforts to discover and study planets beyond our own solar system, Texas Professor Bill Press’s proposal for how to rethink the process of drug trials and approvals in the age of electronic patient records, Sir Martin Rees’s views on the state of our understanding of the universe, and Caltech’s Joseph Kirschvink’s contention that scientific evidence tends to favor the notion that life on this planet most likely started on Mars. 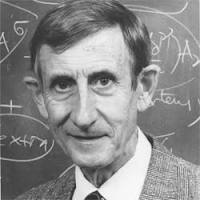 But really, if you haven’t heard about all the different things Freeman Dyson has done, or read any of his writings, you should not miss the opportunity. Start here and here, and enjoy! Many happy returns, Professor Dyson; you have been an inspiration and a role model for several generations of young scientists, and may you have many more happy and healthy years to come! Before we continue, a little terminology — trivial, yet crucial and slightly subtle. Think about the distinction between the words “humanity” and “a human” and “humans”; or “higher education”, “university” and “universities”; or “royalty”, “king” and “kings”. In each case, the three words refer to the general case, the specific case, and a group of specific cases. Sometimes you even have to use context to figure out whether you’re dealing with the general case or a group, because “humans” or “kings” is sometimes used in place of “humanity” or “royalty”. The words “quantum field theory” (with no word in front) refers to the general case: the general type of equations that we use for particle physics and many other fields of study. The words “a quantum field theory” refers to a particular case; an example of a set of equations drawn from the general case called “quantum field theory”. The words “quantum field theories” refers to a group of particular cases: a set of examples, perhaps ones that share something in common. We might talk about “some quantum field theories”, or “all quantum field theories”, or “a few quantum field theories”. Before I go on, I should probably point out that string theory/M theory is different, for a weird (and perhaps temporary) reason — it appears (currently) that there’s only one such theory that has fully consistent mathematics and contains a quantum version of Einstein’s theory of gravity. That was figured out in the 1990s. However, in that theory you need another, similar distinction. Let me postpone a proper definition until later, but roughly, a “string vacuum” is a particular way that string/M theory could manifest itself in a universe; if you changed the string vacuum that we’re in (says string theory), we’d end up with different particles and forces and somewhat different laws governing those particles and forces. Many such vacua would have particles and forces described by a quantum field theory, along with Einstein’s gravity; many (perhaps most) other vacua might not have this property. And so, as before, we need to distinguish “string vacua in general”, “a string vacuum”, and “string vacua”, plural. Now it’s time to talk about quantum field theory — the general case — in more detail. Does quantum field theory as a whole predict anything? In short, if you knew a universe had physics described by a quantum field theory, but you didn’t know which particular quantum field theory, what could you predict? The answer is: almost nothing. If you’ve been following this blog with care, or have read some books or articles about particle physics, you might well think: quantum field theories have fields; and fields have particles; so here’s a prediction: there should be some particles of some type. In short, no particles. This has been known for many decades (I’m actually not sure how far it goes back in the form I just described.) We observe this behavior in experiments — not in particle physics, where it isn’t relevant (at least currently), but in many solids, liquids, electrical conductors, magnets etc. that are undergoing “phase transitions”, such as melting, or spontaneous magnetization. In some cases we can also calculate this behavior, exactly or approximately. In some cases we can see this behavior emerge in computer simulations of real or imaginary materials. So we know there are many quantum field theories that don’t have particles. But If There Are Particles… A Prediction! Again, these are general prediction, not of quantum field theory as a whole, but of the subset of quantum field theories that have particles in the first place. The Standard Model, the quantum field theory that seems to describe much of our world very well so far, is an example of one that has particles. That these are the most important predictions of quantum field theory with particles was pointed out to me, when I was just out of graduate school 20 years ago, by none other than Freeman Dyson, who helped develop quantum field theory back in its infancy. Now, what about specific quantum field theories. What can we predict about them? The answer, hardly surprising, is: it depends. In some quantum field theories, we can predict an enormous amount, by doing some straightforward type of calculation. In others, brute-force computer simulation of the quantum fields makes it possible to study the particles and forces described by that quantum field theory, and allows us to make some predictions. In some quantum field theories, we can predict a smattering of things very well, using fancy math methods (for example, using fancy geometry, or supersymmetry, or string theory). In still others… unfortunately, many of the most interesting… we have absolutely no idea what’s going on. Sometimes we have the equations we’re supposed to use, but none of our methods for calculation work for those equations. Occasionally we can make a good guess, but we can’t always check it. In yet others, we don’t even know what the equations are that we should use to start studying them. In fact, the existence of some of these theories was, until relatively recently, unknown. We didn’t even suspect they existed. Maybe there are even more that we still don’t know about. I’ll start describing these categories of quantum field theories in my ensuing posts. Fortunately for particle physicists, the Standard Model is mostly in the first category, with a little leakage into the second. Over the past week or so, there has been unnecessary confusion created about whether or not there’s some relationship between (a) the Higgs particle, recently discovered at the Large Hadron Collider, and (b) the Big Bang, perhaps specifically having to do with the period of “Cosmic Inflation” which is believed by many scientists to explain why the universe is so uniform, relatively speaking. This blurring of the lines between logically separate subjects — let’s call it “Cosmic Conflation” — makes it harder for the public to understand the science, and I don’t think it serves society well. For the current round of confusion, we may thank professor Michio Kaku, and before him professor Leon Lederman (who may or may not have invented the term “God Particle” but blames it on his publisher), helpfully carried into the wider world by various reporters, as Sean Carroll observed here. I’ve been quite busy with some physics research this week, but I have nevertheless managed to finish a new article on electrons, part of my Structure of Matter series, which aims (among other things) to introduce a non-expert to particle physics, step-by-step. The completion of this article feels like a significant step for this website. After all, the electron was the first subatomic particle and the first of the apparently-elementary particles to be discovered, about 115 years ago, and its discovery really gave birth to the field of particle physics we know today. Moreover, it was the failure to describe the behavior of electrons within and outside of atoms that forced physicists to go beyond Newtonian views of physics processes, and introduce the theory of quantum mechanics. Electrons, tiny as they are, are enormous in human life; they play a key role in all chemical reactions, including those that sustain our bodies. Beyond that, they lie at the heart of much modern technology — electronics! And there’s more. So no particle physics website can be complete without an electron webpage. Looking ahead, a question I sometimes get asked is whether I’m sure electrons (or any other elementary particles that physicists talk about) really exist. After all, it is true I’ve never seen a picture of one taken with any sort of microscope! Well, in answer to this question, I want to write an article on why we particle physicists are so confident that electrons (and atomic nuclei) exist… explaining the types of experiments and the types of logical reasoning that lead to this conclusion. I suspect a lot of readers will find such an article interesting; after all, why should one take expert knowledge for granted just because it appears in a textbook or on a website? Readers should demand to know where the knowledge came from — and a writer should be prepared to answer.